Kodomo no Hi - a Japanese FREEBIE! This is our first year "celebrating" Kodomo no Hi, Japan's Children's Day. With Mag having one Japanese uncle and another Japanese almost-uncle, I'm not sure how we missed this event in past years... but anyway, better late that never. 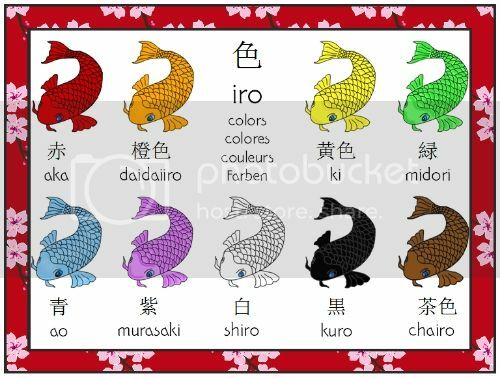 For today's focused fun, we learned color names in Japanese. 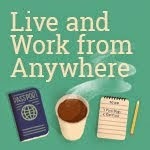 There's something fun (and easy!) about color names in other languages, isn't there? 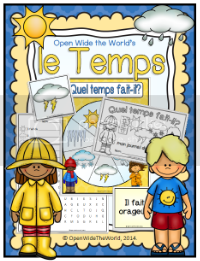 I made a mini-poster and a coloring sheet for this activity, which are available for FREE at my TpT* store. The poster is in Japanese (complete with Japanese characters!). 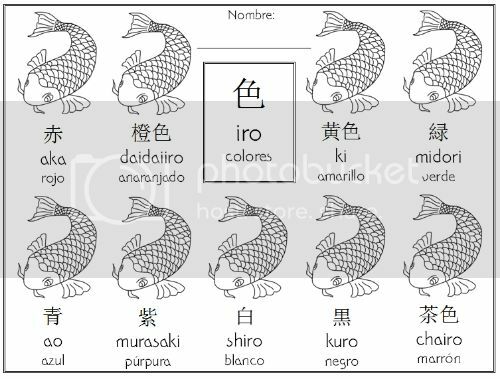 Each coloring sheet combines Japanese with 1 of 4 languages, English, Spanish, French, or German, making them perfect for school, homeschool, dual language immersion programs, everyone! *Why do I love TpT? 80,000+ free teaching resources (like my Kodomo no Hi freebie!)... plus a lot of great not-free ones, too... what's not to love? Race on over and become a member! 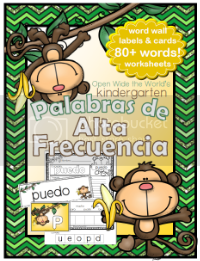 This post is linked up to "Manic Monday" FREEBIE linky party at Classroom Freebies. 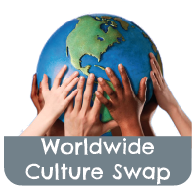 Swing over to check out 90+ freebies (at the time of this posting... more to come, I'm sure). Yes, we all love a good Cinco de Mayo celebration. The food, the music, the piñata... But have you ever wondered if there might be more to the Fifth of May than just what's happening South of the Border? Well, there is! "Kodomo no Hi" is Children's Day in Japan. Like Mexico's Cinco de Mayo, Kodomo no Hi is celebrated on the fifth day of the fifth month of the year. 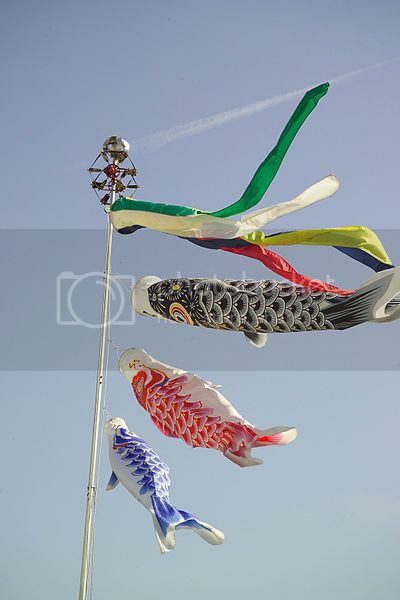 The most noticeable tradition associated with Kodomo no Hi is the koinobori pole. In the past, only families with sons flew these koi-shaped windsocks atop their homes. These days, the koinobori generally represent sons and daughters of a family. Traditionally, the top koinobori is black, representing the father, followed by a red koinobori for the mother. Below that are seen a blue koinobori for the eldest son/child, then green for the next child, and either purple or orange (depending on the region) for more children. Kashiwa-mochi (rice cakes filled with red bean paste and wrapped in oak leaves) and chimaki (sweet rice paste wrapped in an iris or bamboo leaf) are traditionally served on this day. We will be making koinobori later in the week, and possibly trying our hand at a modified mochi recipe... or maybe swinging by the local Asian grocery store to see what they have for the big event. And you? Have you celebrated Kodomo no Hi? Any fun ideas? A Healthier Baguette? ...Mais oui! I am almost ashamed to admit it, but since posting about my first homemade baguette only 5 days ago, I have since made the quintessential French bread 3 more times. Mais oui, trois fois! ...and I have my insurance physical coming up in mere days. Youch! Any hope that I'll still qualify for reduced good-health premiums after this carbohydrate extravaganza? Place ingredients in bread machine according to manufacturer's directions. Start machine on dough setting. When dough cycle is complete, remove dough to floured surface and cut in half. Shape each half into a loaf about 12 inches long, in the shape of a baguette. Use kitchen scissors to make several slits across the top of the loaves. Place on greased/silicone-lined baking sheet and cover with a towel. Let rise in a warm place until doubled, about 40 minutes. After letting rise, brush with egg wash, if desired, for crustier baguette. Mais oui, trois fois! (French) = But yes, 3 times! Vive les avoines! (French) = Long live the oats! Remember a few years back, when an intriguing book by Mireille Guiliano was all the rage? 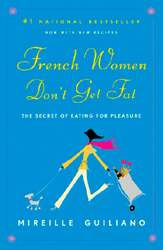 French Women Don't Get Fat... the concept captivated American women, at the same time infuriating us by its insinuation. I must admit, I didn't read the book when it was first out. I had already lived in France, had been changed by it, had no need to understand its relationship with food on such a cognitive level. Now, however, after spending the past 3 weeks in France (and/or along its border), participating in phenomenal gastronomic events on a daily basis, I am completely fascinated by the premise of this book. Once I catch up with the laundry and remember just where the empty suitcase is supposed to get stored, French Women Don't Get Fat is moving to the top of my to-do list! I mean really, did I truly eat what I ate for the last 3 weeks and not gain a single pound? How is that possible? I have got to get that book! While waiting to read the book, and in an effort to keep the spirit of travel alive, I have decided to not return to my American eating habits just yet. It has been croissants and café for le petit déj each morning since our return on Monday. French breakfasts have been so enjoyable that today, when the pangs for le goûter hit, I decided it wasn't yet time to revert to American snacking styles, either, and threw together my first ever homemade baguette. When dough cycle is complete, remove dough with floured hands and cut in half on floured surface. Shape each half of dough into a loaf about 12 inches long, in the shape of a baguette. Bake at 450ºF for 14-18 minutes, rotating the pan after 8 minutes. We could barely wait for this to cool, and when it did, it was worth its weight in Nutella, which, of course, we generously smeared on each delicious bite. I might be so bold as to say this was actually better than baguette from a boulangerie; it had a satisfyingly crunchy crust that fell just short of tearing up the roof of the mouth like a true baguette would have. 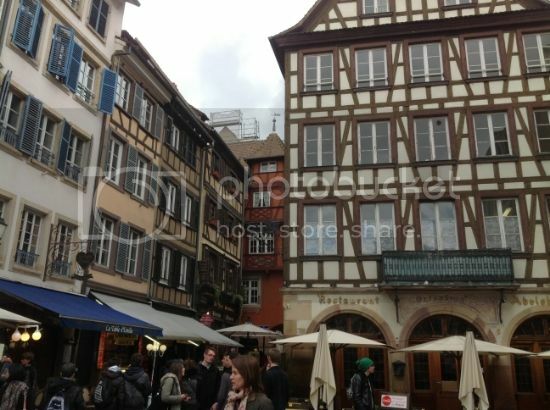 Yesterday we visited the city of Strasbourg (whose name comes from Germanic origins meaning "crossroads" and "fortress"), in the Alsace region of France. 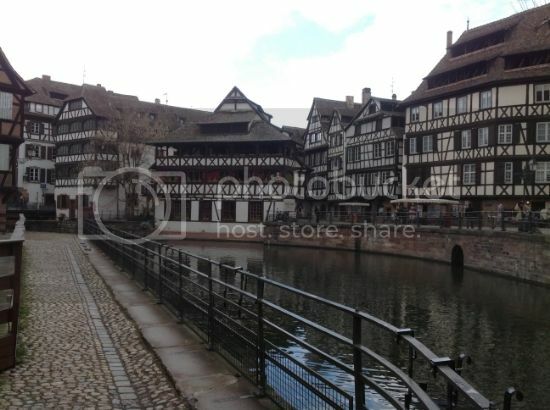 Originally named Argentoratum, Strasbourg has been the site of permanent settlement since the year 12 BC. When Strasbourg's Gothic cathedral, constructed of red stones from the nearby Vosges mountains, was completed in 1439, it surpassed the pyramids of Gaza in height to become the tallest construction in the world. The spire remained the tallest in Christendom until the 19th century. The German Johannes Gutenberg exiled himself to Strasbourg, where he lived at the time of inventing the printing press. Somewhat related, the world's first public newspaper was printed in Strasbourg. The French national anthem, La Marseillaise, originally entitled "The War Song for the Army of the Rhine," was composed in Strasbourg at the request of the mayor of the city. 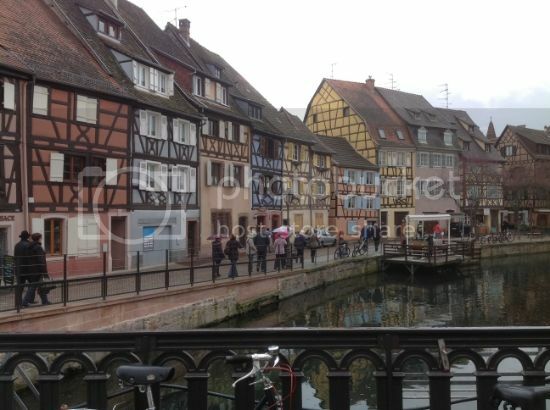 We have spent these recent days touring the major cities of Alsace. 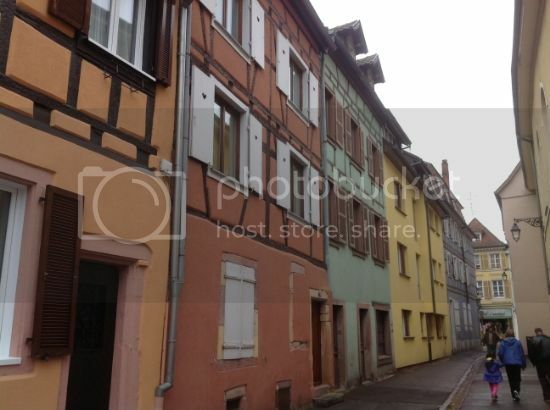 However, it was a tiny Alsatian village that we called home at night. 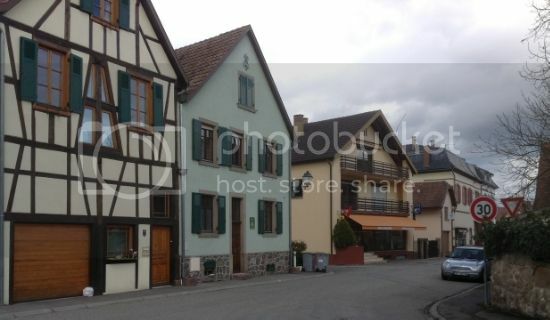 Baldenheim is so small that it has no restaurant of its own. 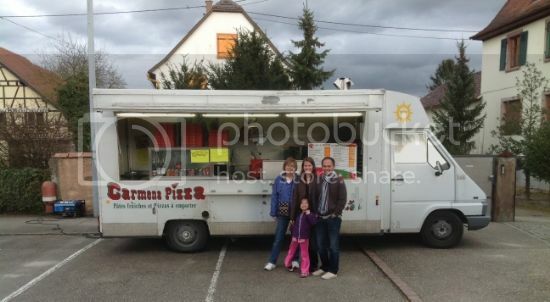 However, once a week, a traveling restaurant comes to town, parks in front of the mayor's office, and offers made-to-order pizza to anyone with 6€ to spare. Il ne reste que trois jours, puis nous rentrons chez nous. 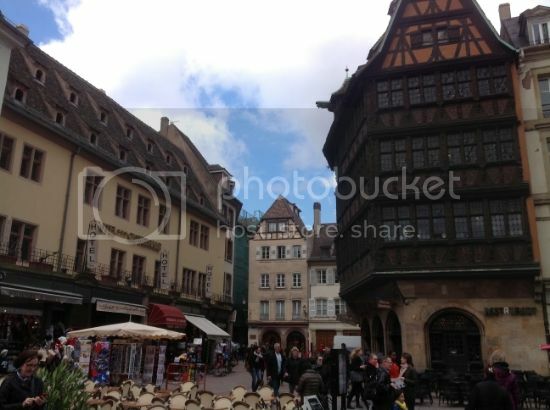 Today, traces of all eras of Colmar's history are evident in its food, architecture, language, and culture. 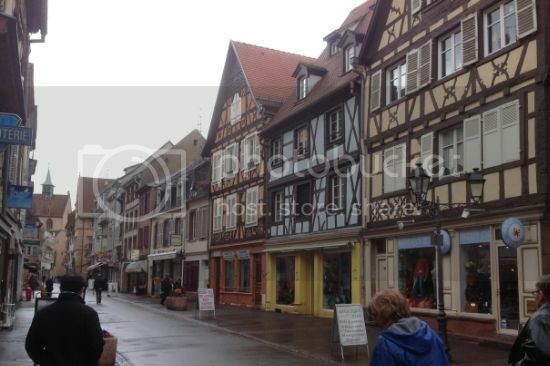 Also of special interest to Americans, Colmar was the home of Frédéric Auguste Bartholdi, the sculptor who created the Statue of Liberty, and many other works throughout this city. Such a delightful city to visit! We have been without Internet our whole week in Germany. I am looking forward to taking some time soon to write a little about the Mosel River Valley region. 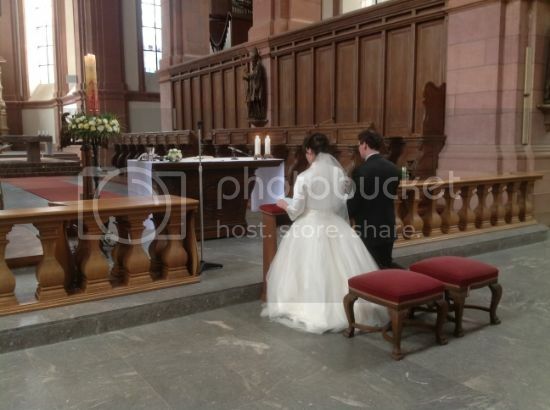 In the meantime, though, I wanted to post a few wedding pictures for any family and friends at home who are waiting for a quick look at the big event... and for anyone else interested in having a peek at a German wedding. Here is a shot inside the abbey. You might notice there is no bridal party, just the bride and groom. 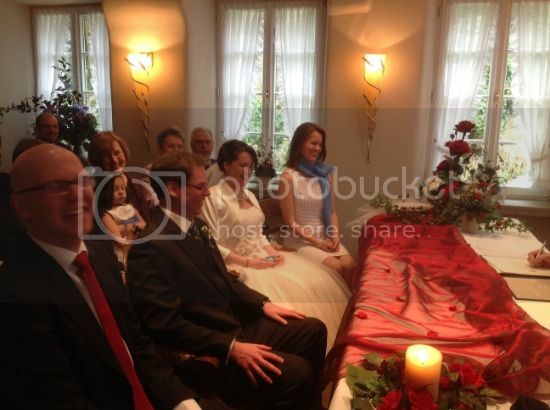 German wedding couples have no bridesmaids or groomsmen. However, I was fortunate enough to be a "Trauzeuge," or witness. That position allowed me the honor of signing a fair number of forms, as well as front row seats at the civil ceremony and mass. We did inject a small degree of American tradition by color-coordinating my scarf with the groom's tie and flower girls' sashes, but that was as far as it went. How different from the extremes of a typical wedding in the US! 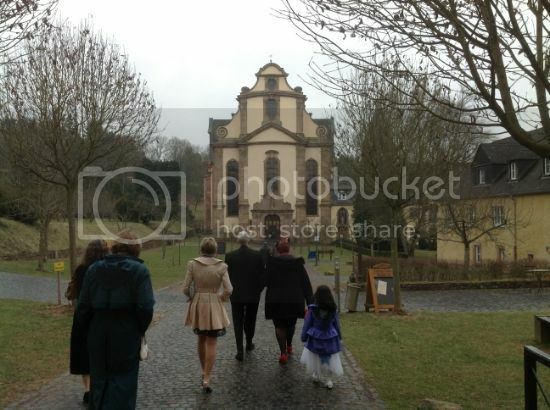 Oh, and you might notice that my sister is wearing a jacket with her gown... there is no heating system in a remote, centuries-old German abbey, and it was only about 40 degrees indoors and out. Youch! A glimpse of the reception. 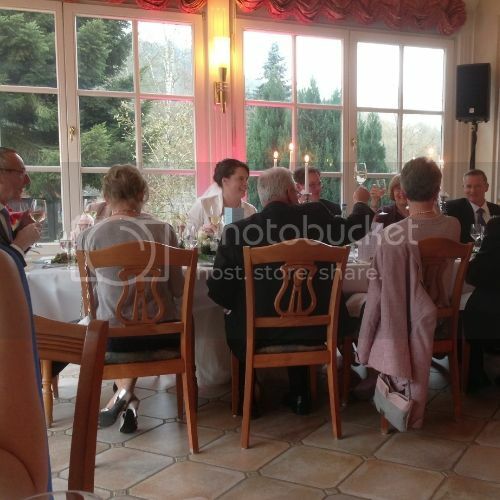 The wedding dinner included an impressive buffet of regional and national specialties, wines and cheeses. We have found, surprisingly, that German food surpasses all expectation, with the wedding feast being the pinnacle. We are surprised that we have preferred German food to French cuisine. I know, a shocker! Another favorite moment was the first dance, which was a Viennese Waltz. My BIL had been a competitive ballroom dancer in the past, so their first dance was beautiful to observe. Unfortunately, I don't have a pic of that yet today. Also worth mentioning was my father's toast, which he worked on diligently for weeks to present in German. Some of us with lesser German skills are still waiting for release of the official translation, but it appeared to be very well received by the host nationals. 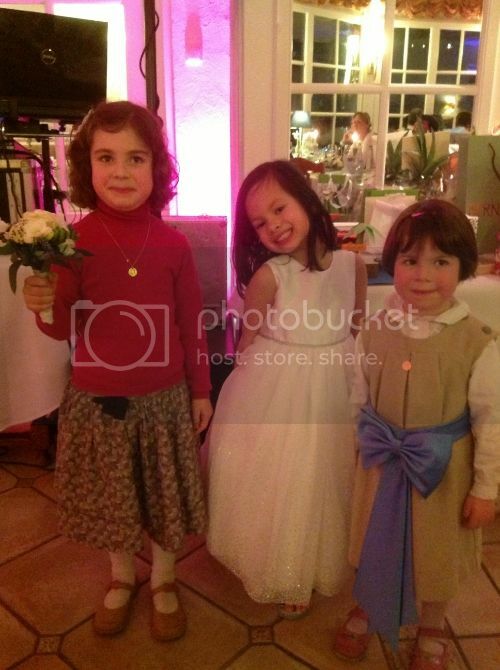 And finally, one of my favorite pictures of the day: Mag and her new French cousins (the daughters of my sister's French "sisters" of the family she lived with in France, many years ago) They look so French, n'est ce pas?! And now, packing to head back to France, this time the Alsace region.